Screen enclosures can maximize the overall space of Pensacola, Florida, homes. A screen room will provide a place for you and your family to enjoy the outdoors without worrying about common outside nuisances, like bugs and harmful UV rays. Whether you want an extra room to host parties, cultivate a garden, enclose a hot tub, or enjoy a meal with a view, a new screen enclosure can provide the space you need. 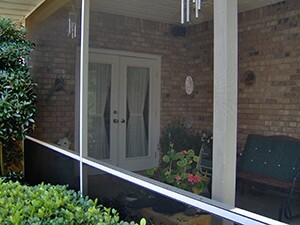 Majors Home Improvement is the company to call for screen enclosures in Pensacola, FL. We are a local, family-owned business that has been serving in the area since 1997, providing quality home improvement upgrades that stand the test of time. When you turn to Majors Home Improvement for a screen enclosure, you can count on your new addition to be installed by factory-trained craftsmen who are diligent and efficient in their work. Furthermore, you’ll receive a warranty protecting parts and labor to ensure your investment is protected. If you’d like to learn more about the screen enclosures we install, contact Majors Home Improvement today. When you do, we’ll be pleased to tell you about the financing options we have for qualified homeowners in Pensacola, FL.